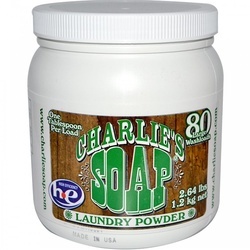 shop Charlies Soap Laundry Powder 80Lds 6x2.64LB | bargainbrute. Charlie's Soap Laundry Powder is a laundry detergent originally developed for use in textile quality control labs.Charlie's Soap is truly the answer to getting the cleanest clothes with the biggest savings while at the same time caring for the environment.Charlie's Soap Laundry Powder is a clear, scent-free laundry powder that cleans thoroughly, rinses completely, and leaves nothing behind but the sweet smell of clean.Here are just a few of the benefits of using Charlie's SoapOnly use one (1) tablespoon per large load!Safe for all HE machines.Softeners are not recommended or needed. That means even greater savings on your laundry!Non-toxic & completely biodegradable.Safe and effective for all fabrics, including silk, wool, linen, cotton and high-tech micro fibers.Contains no clays, dyes, phosphates, ultraviolet brighteners or perfumes.Will not fade your colors.Removes entrapped odors from athletic wear.